Solar energy is the primary source of energy on Earth and is responsible for almost all natural processes (see how does solar energy work). 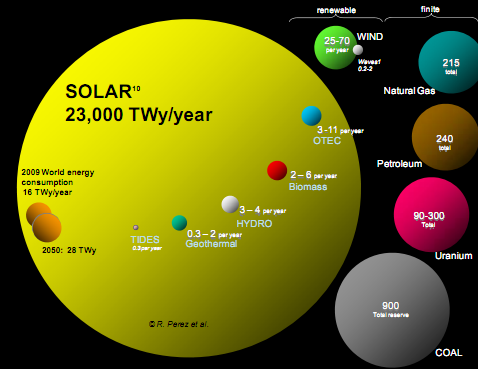 Our Earth receives roughly 1000 watts (that’s a Joule / second) of solar energy per square meter of land area, and amazingly enough all this is generated by thermonuclear explosions within the sun. Part of the massive amount of energy released by the sun reaches the earth in the form of solar radiation although most is reflected or absorbed before it reaches the Earth’s surface. Solar energy usually refers to different ways the sun’s energy can be used to generate solar power. Direct or photovoltaic conversion: Sunlight can be converted directly into electricity by using solar panels. Solar panels are comprised of photovoltaic cells or solar cells that are arranged in a grid-like pattern on its surface. The individual solar cells are made of special semiconducting materials like silicon. When solar energy strikes this surface, the solar cell converts the solar radiation into useful electrical energy (a direct current) which can be used in the home (see also: how do solar panels work). Indirect or solar thermal conversion: In this method, sun’s energy is used to create heat to boil water. Mirrors or reflectors are used to concentrate sunlight (like a magnifying glass) onto containers full of liquid (it’s often water, but other liquids are also used which retain heat better). The liquids are heated up to a high-enough temperatures to produce steam, and this steam is used to rotate a steam turbine that produces electricity (see also: solar thermal energy facts). Solar power is also used directly to power all sorts of electronic equipment, from handheld calculators, to power emergency road signs or call boxes, overhead lights in parking lots, and even some experimental vehicles (see portable solar power systems). Solar power is also used by satellites, where array of solar cells provide reliable power for the satellite’s electrical systems.